Is It True That Green Tea Is Bad for Pregnant Women? Growers make kukicha tea from a variety of twigs and coarse leaves from the Camellia sinensis plant that they roast separately according to size. The roasting process gives this tea a distinct smoky flavor. George Ohsawa, the founder of the macrobiotic diet, brought kukicha tea to the U.S. in the 1960s from Japan. 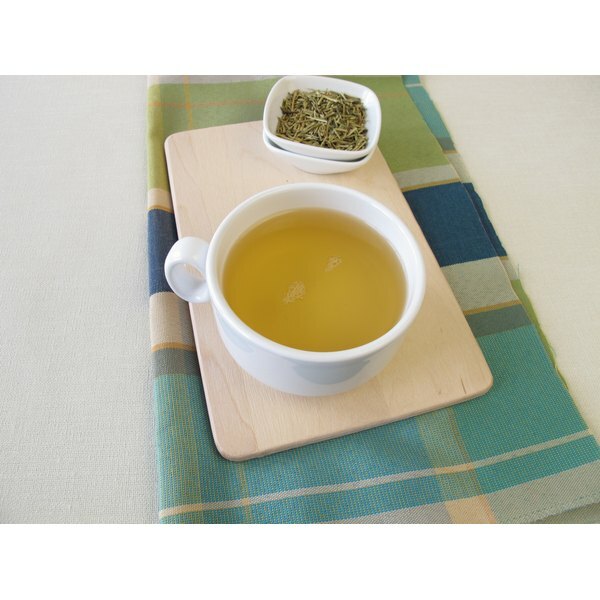 The tea is a healthy complement to a macrobiotic diet because of its alkalizing properties and low caffeine level. A cup of kukicha tea has 90 percent less caffeine than a cup of regular brewed coffee, which has between 95 to 200 mg of caffeine per 8 oz., depending on the variety and amount of coffee used. Kukicha has the lowest caffeine content of all the traditional teas. Green tea, for example, contains 41 percent less caffeine than coffee. Caffeine stresses the immune system and makes the heart work harder than it should. It can cause jitteriness, anxiety and infertility. It leaches calcium from the bones and dehydrates you because of its diuretic properties. Researchers also link caffeine to breast cysts. Consuming a beverage low in caffeine like kukicha tea can stave off some of the negative effects of caffeine. Alicia Silverstone, star of the movie "Clueless" and author of the plant-based diet book "The Kind Diet," uses kukicha tea as her "cure-all" tea. She claims that this tea, when combined with umeboshi plum and shoyu, restores your blood mineral balance and can help with hangovers and nausea, reduce heartburn, relieve digestive distress and stabilize blood sugar levels if you have eaten too much refined white sugar. Shoyu is a soy sauce made from soybeans, salt and wheat. An umeboshi plum is a sour, pickled plum that helps alkalize your blood.